Babies and small children clothes. Babies and small children have a more sensitive skin by nature. Jimo Lava-Roupas Baby was especially developed to wash baby’s clothes. It has a hypoallergenic and dermatologically tested formula, also being less aggressive for the fabric fibers. Its soft fragrance gives the clothes the sensation of coziness which every baby deserves to have. Washing machine: For a full machine, add 2 topfulls to the machine compartment. Manual washing: Add 1 topfull for each 10 liters of water. 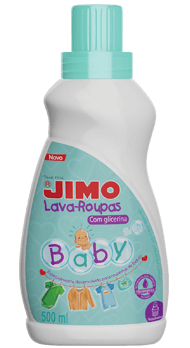 Use with Jimo Amaciante Baby to make a perfect pair!